United Maundy Thursday Communion Service at Elvet 7.30pm and the Good Friday Service 10.30am at North Road. 11/05 Good Old Days Evening £10 step back in time, dress up or come as you are. Audience participation tickets from: mm@elvet-church.org.uk. Easter Day all welcome at Elvet at 10.45 for Family Easter Communion. Come and celebrate the Risen Christ and decorate the Cross with flowers. Welcome to Elvet Church and our web-site. We are in the centre of Durham, England, situated in Old Elvet, three minutes walk east of the market place. Our main Sunday services are at 10.45am (with a Junior Church), and at 6pm. More information on these,and other services are on our Regular Services page. We also have many weekday activities. Members of these groups have contributed to this web-site, and their information can be viewed via the Church Activities pages. We are also home to Durham University JAMSoc (Joint Anglican and Methodist Society). 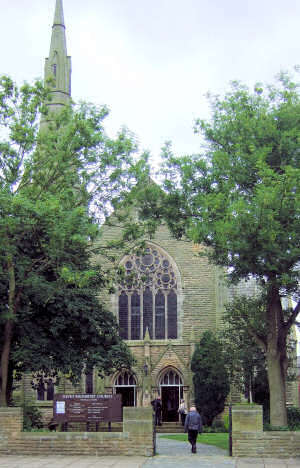 There is wheel-chair access to both the main church; and at the side of the church (to the church hall and rooms behind the church). There is a lift to the one upstairs room. The aims of Elvet Church, and the way it aims to meet these are given on a separate page. The Calendar page gives information on what is going on at the church, and what the various groups are doing. Events at Elvet lists public concerts etc. that are being held at Elvet Methodist Church. You can contact key people at the church from the Contacts page. We also have links to other relevant web-sites.